Rococo Systems & Design creates beautiful bespoke home cinemas for properties of all sizes and styles. A private cinema room is a desirable feature for any house, not only does it allow you to enjoy your favourite films in the comfort of your own home, but it also increases the property value. At Rococo Systems we use only the most advanced technology to help you create the perfect cinematic experience. 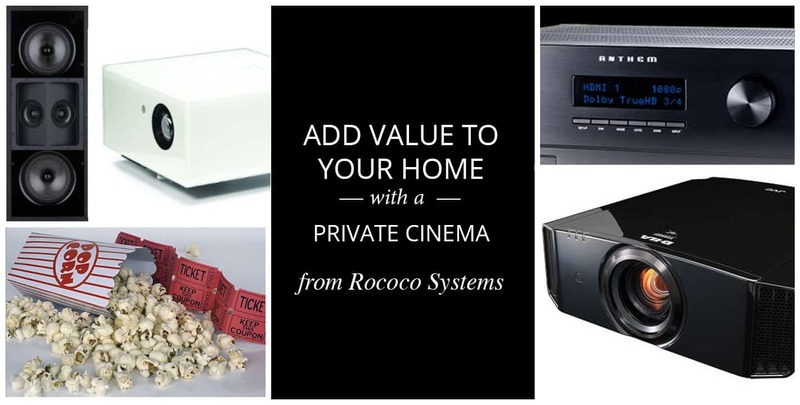 Not only can you purchase your screens, sound systems and technology from Rococo Systems, but we have partnerships with suppliers across the country. Our team of talented designers can help you complete the project with plush cinema seating, mood lighting and beautiful interiors. We can even work alongside your chosen architect or cabinet maker. For ideas and inspiration, take a look at our full home cinema range online. Rococo Systems offers a range of technologies for varied environments. We create discrete hidden cinemas that can be revealed at the push of a button. These are well suited to homes that do not have the space to dedicate a full room, but still desire the luxury of a private cinema experience. We even create outdoor and waterproof cinema arrangements. These are very popular amongst hotels, spas and clients with a private pool or large outdoor space. Book an appointment to visit our experts today. Our specialists take the time to sit down with each client to discuss the best home cinema options within your budget. We can even visit your property to provide you with more detailed recommendations, based on the acoustics, style and size of the room. You can visit our Essex Office on 01277 890888 or our London office on 020 74541234. Alternatively, you can contact the Rococo Systems & Design team online.